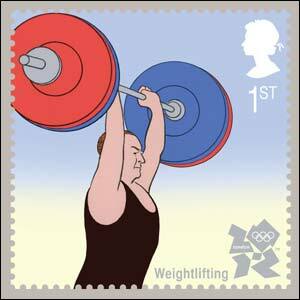 Royal Mail has commissioned some of Britain’s most exciting artists and illustrators to create three sets of stamps to be issued in the run up to the London 2012 Olympic Games. 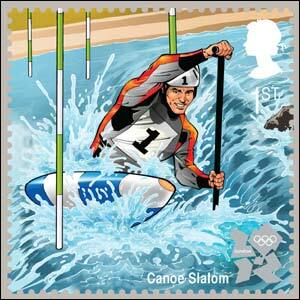 A total of 30 1st Class stamps will be issued in the Olympic and Paralympic Games series, with the first ten going on sale on 22 October 2009. 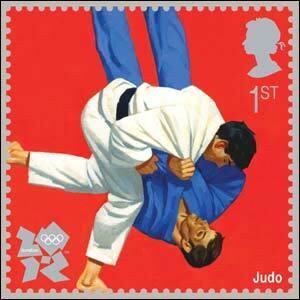 Royal Mail is working with illustrators and fine artists to create the stamps which will highlight both the sporting and cultural significance of this incredible event. 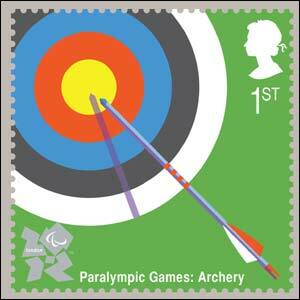 Each stamp will champion an Olympic or Paralympic sport and they will be issued in three sets in 2009, 2010 and 2011. 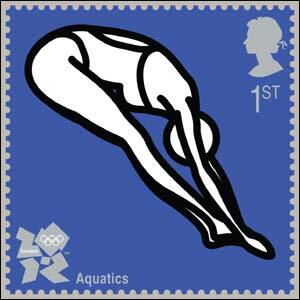 Among the sports featured on the first set of stamps is diving, with a distinctive illustration by the leading contemporary artist Julian Opie, alongside the lesser known Paralympic sport of boccia. 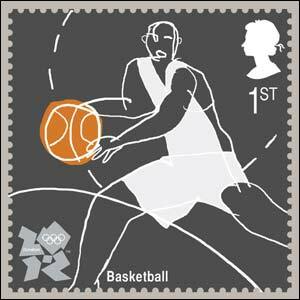 Julietta Edgar, Head of Special Stamps, Royal Mail said: "Royal Mail has always been there to celebrate and commemorate significant moments in our history and the London 2012 Olympic Games is one of the greatest events on the planet. 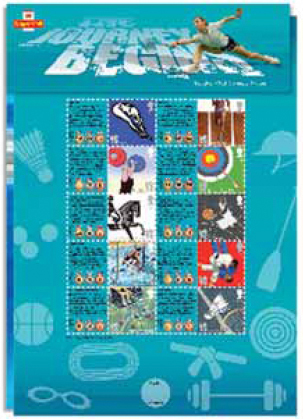 "We hope these stamps play their part in the countdown to the Games, but also to highlight both the sporting and cultural legacy of this wonderful event." 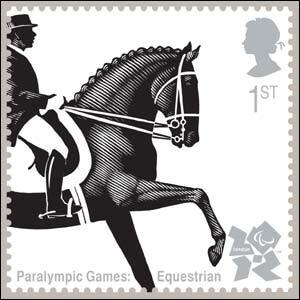 The 30 stamps mark the 30th Olympiad and London 2012 Paralympic Games and are official products of the London 2012 Olympics. 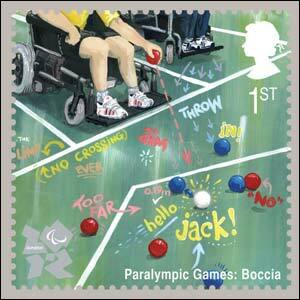 Each stamp will feature either the London 2012 Olympic Games or Paralympic Games logo. 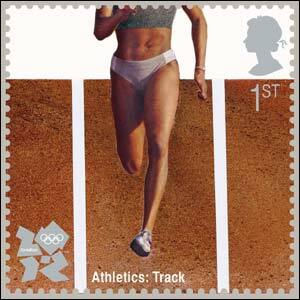 London 2012 Chairman Sebastian Coe welcomed the announcement: "I’m thrilled and proud that London 2012 is going to be working with Royal Mail to produce these stamps. It is a huge honour to have stamps created in celebration of the Games and we look forward to working with Royal Mail over the next three years. 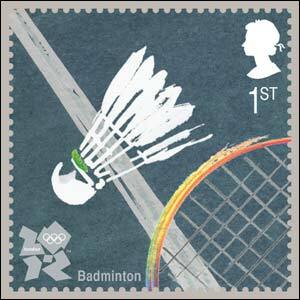 These stamps will be a wonderful way to celebrate the London 2012 Games and means that the whole country can get involved in this fantastic festival of sport between now and 2012." 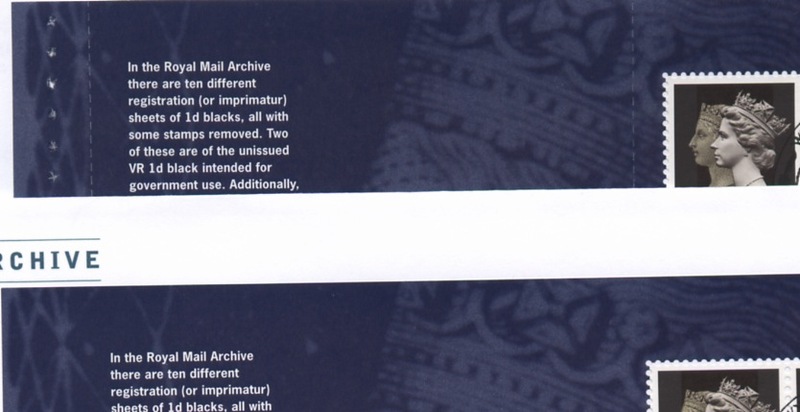 I have full details and images, but dealers received explicit instructions from Royal Mail today not to publish anything until given full permission. 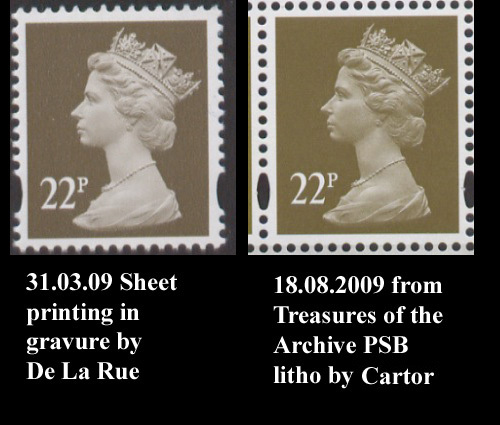 The information has been published with a link to these two images. The loose versions of pane 1 from the ToA booklet are markedly different to those in the books: they have no rouletting at all. This ought to be mentioned in some of the more specialist catalogues. 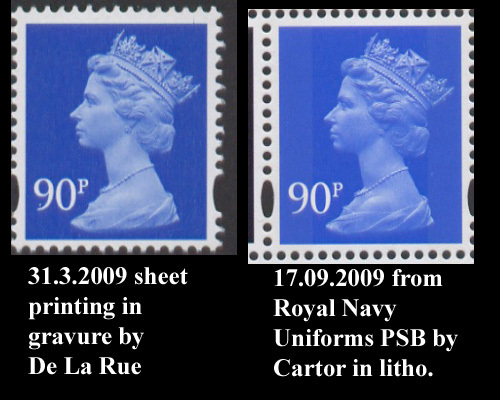 As must be expected the Machin definitives in Prestige Stamp Books are usually distinguishable from those issued in sheets, if only because of the different printing process. But colour shades, depth of shading on the portrait, and even positions of the face value also vary. 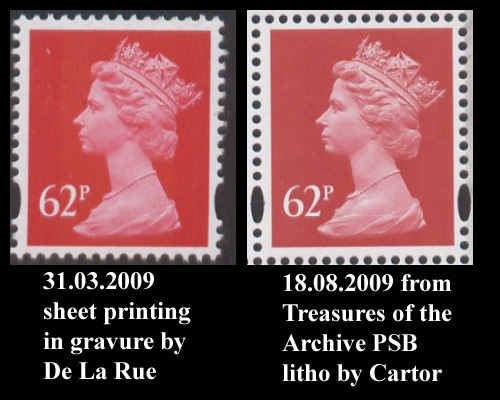 Here I'm comparing the 17p, 22p, 62p & 90p definitives issued in sheets on 31 March 2009, printed in gravure by De La Rue, with the latest booklets. 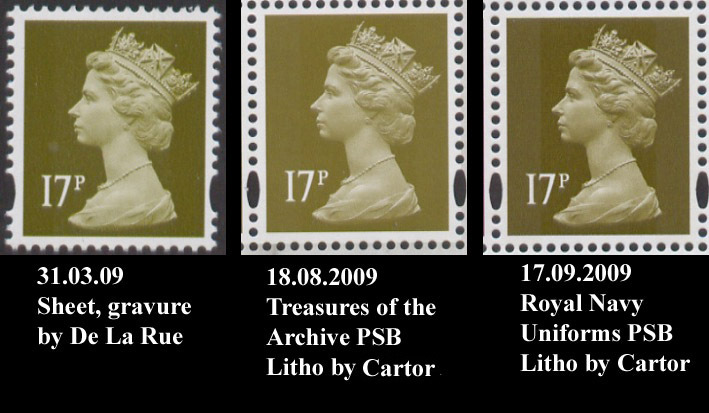 All these images are scanned in the same session, so are directly comparable. I have been advised by an eagle-eyed viewer that the Treasures book was in fact printed by Cartor, according to the imprint, and not by the parent company Walsall SP. 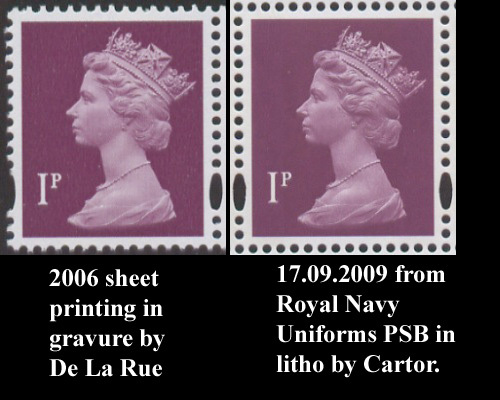 I don't have time to change the captions, but it does mean that the two 17p stamps were printed by the same company - and they are different! Due to other commitments I've been unable to provide details here or on the website about the 2009 Christmas stamps, which feature stained glass windows. ... as well as a miniature sheet and Smilers sheet, the last of which you can see here . I must admit this is one of the better designed Smilers in recent years. OK some labels show only arms rather than heads, but better than the Pantomime of last year, I think. As in previous years, the Madonna and Child stamps will be reissued though I'm not sure why, as both 1st class stamps feature the Madonna and Child and the rest are quite obviously religious?